Most entrepreneurs know the long odds: only a fraction of them will lead their enterprises through the rocky stages of growth to launch self-sustaining companies. Very few know how to outflank the failures that await them at every turn, including the most painful--being abandoned by key members of their team or getting pushed out by their board just as their business starts to generate real value. Derek Lidow is on a mission to improve these odds and change these outcomes. Throughout his long career--as CEO, innovator, and entrepreneur--he has tested virtually every aspect of launching a business. Lidow now argues that success is far less dependent upon a firm's idea or any grand strategy than it is upon something more personal: leadership. Emerging companies have specific leadership requirements, stage by fast-moving stage. Few founders have been able to leverage the tremendous power of this underrecognized reality--until now. With Lidow's help, you will learn how to become the startup leader your business needs, and you'll move forward with your plans with greater confidence and success. 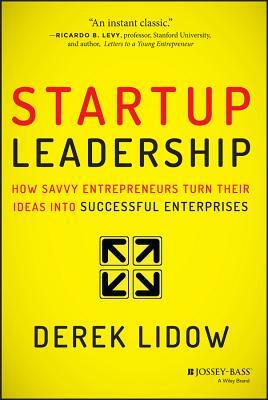 Derek Lidow is a longtime global CEO, innovator, and entrepreneur. Among other accomplishments, Lidow is widely known as one of the world's top experts on the electronics industry; his contributions range from patents to value chain applications that have forever improved companies as diverse as Sony, Samsung, Philips, Goldman Sachs, and IBM. Today, Lidow teaches Entrepreneurial Leadership and Creativity, Innovation, and Design at Princeton University. He keynotes on the subject of startup leadership and is a media commentator; Lidow's coverage to date includes the New York Times, Wall Street Journal, BusinessWeek, Forbes, Bloomberg, the Economist, Nikkei, Reuters, and Taipei Times, as well as many top bloggers. Prior to joining Princeton's faculty, Lidow was founder and CEO of iSuppli, which he sold to IHS in 2010 for over $100 million. Lidow's degrees are from Princeton and Stanford, where he earned a PhD in applied physics as a Hertz Foundation Fellow. He is based in New York City and Princeton, New Jersey. For more information, please visit DerekLidow.com.